The ISO/IEC 17065:2012 is an international standard for product certification bodies. To achieve ISO 17065 certification, organizations must have to implement quality management system and prepare documents that conform to the requirements of ISO 17065:2012 standard. We offer online ISO 17065 documentation consultancy, which is accomplished by collecting required information online from clients via e-mail and other digital mediums and preparing documents for their organization by using our documentation toolkit. 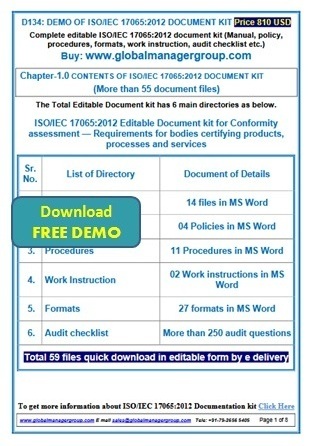 The Ready-to-use ISO 17065 documents for product certifying bodies, include sample copy of ISO 17065 manual drafted and endorsed to ensure effective quality management system, ISO 17065 procedures, SOPs, sample formats as well as ready-to-use ISO 17065 audit checklists etc. All the documents are written in plain English and provided in editable word format, which saves time and cost of documentation, and hence, overall certification. Germany, UAE, Saudi Arabia, Qatar, Malaysia, Singapore, Asia, Hongkong, South Korea and South Africa. Desclaimer: We are providing sample documents and training kits for various system certification. We are not associated or part of ISO Body. We are not selling any ISO standards or ISO copyright materials. For purchase or informaton related to all such ISO standards visit www.iso.org.